After missing its first year in nearly four decades, the California Caucus of Colleges and University Ombuds returns to Asilomar in Pacific Grove, California, November 7-12, 2010. 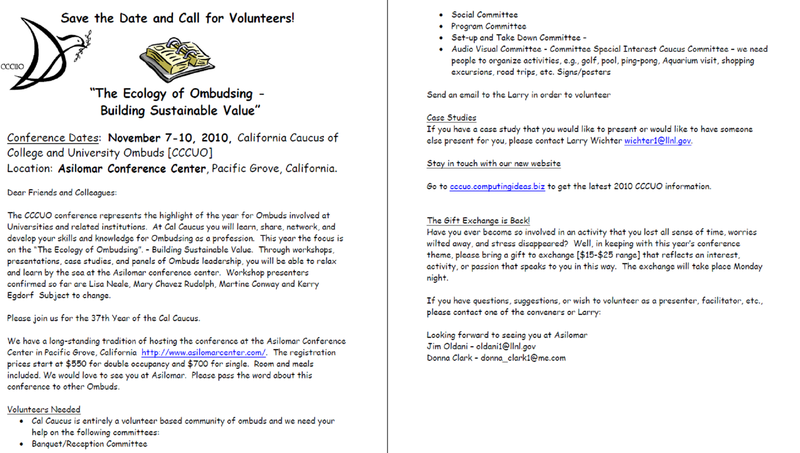 The conference has been a fixture for West Coast Ombuds since 1973, but did not occur in 2009 due to declining attendance. Organizers and stakeholders have spent the past year strategizing about return of the event, which is uniquely different than other Ombuds conferences. This year, workshops, presentations, case studies, and panels of Ombuds will focus on the theme of “The Ecology of Ombudsing – Building Sustainable Value." Confirmed workshop presenters include Lisa Neale and Mary Chavez Rudolph (University of Colorado, Denver), Martine Conway (University of Victoria) and Kerry Egdorf (Marquette University). Volunteers and case studies are being solicited. Click flyer for details. Related posts: New Website for California Caucus; Cal Caucus Sets Conference Call.